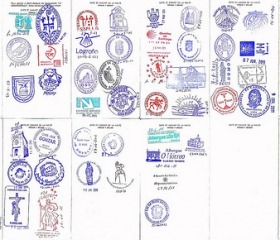 The Credencial or Pilgrim’s passport is part of your Camino experience. While it is not strictly neccessary to have one if your are not staying in Albergues they are are still a great memento of your trip and will entitle you to your Compostela certificate once you reach Santiago. This is providing that you have (a) walked at least 100km – at least from Sarria (b) cycled at least 200km ( Ponferrada). A pilgrims passport is the official identification that is used along the various Caminos to prove that you are indeed a Pilgrim and that you have walked /cycled and visited the various places along the way. There are various versions of the passports in circulation and different countries sometimes have their own versions issued though a local association or ‘Confraternity’ that issue them. Apart from these sanctioned ones they must be the official version issued by the Cathedral in Santiago, these can be picked up at most Pilgrim offices or Albergues along the way. The passport itself just a simple card with blank pages to collect stamps from various hostels, churches and albergues. . Cost and where to get one? A Credencial per person is supplied with each Camino booking with Raw Travel. The cost of a passport is only a few Euros if issued in France or Spain. The favourite places to start the Camino Frances are in St Jean de Pied Port, Roncesvalles, and Pamplona. You can also find them in major centres such as Burgos, Leon, Sarria – ask at the Cathedrals or an Albergue on the list below. In St Jean Pied de Port at the pilgrims office they spend all day handing out the passports during the busy times of June, July, and August. ST. JEAN DE PIED PORT – Office de Peregrino. RONCESVALLES – Office del Peregrino. JACA – Iglesia de Santiago. LARRASOANA – Albergue Municipal de Peregrinos (D. Santiago Zubiri). PAMPLONA – Albergue de peregrinos. PUENTE LA REINA – Albergue de peregrinos. ESTELLA – Albergue de peregrinos. LOGRONO – Albergue Municipal de peregrinos. SANTO DOMINGO DE LA CALZADA – Albergue de peregrinos de la CofradÃ­a del Santo. BURGOS – Albergue de peregrinos (AsociaciÃ³n de amigos del Camino de Burgos). FROMISTA – Oficina del peregrino (Monasterio de San Zoilo). LEON – Albergue de peregrinos. ASTORGA – Albergue de peregrinos. MOLINASECA – Albergue de peregrinos (Alfredo). PONFERRADA – Albergue de peregrinos. VILLAFRANCA DEL BIERZO – Albergue de peregrinos AVE FÃNIX (Jato). O’CEBREIRO – Albergue de peregrinos. SAMOS – Albergue del Monasterio. SARRIA – Albergue de peregrinos. PORTOMARIN – Albergue de peregrinos. Last year from May 8th to June 14th I walked from St Jean Pied de Port among thousands but solo traveller. I walked with God and was blessed in so many ways. I was met by many people from all over the world who were kind and helpful, some became friends and we are still in touch today. Thanks Very helpful. I was checking the cycle eligibility. Have a couple of queries you may be able to assist. Can the 200km be travelled anywhere on the Camino or does it have to be from Ponferrada; and is there a similar credential for the French Way of St James.